Vertis Communications is a premier provider of targeted advertising and marketing solutions to America’s leading retail and consumer services companies. By providing proprietary research, digital program management systems, data-driven targeting technology, and world-class production expertise, the company is able to produce print advertising and direct marketing programs that deliver superior program performance and better results per program dollar. Vertis employees continually strive to gain and maintain a competitive edge. A prime example of this is a facility enhancement at their Chalfont, Pennsylvania location. This plant was in dire need of improved storage capacity. 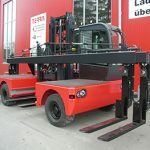 Narrow aisle forklift trucks were given consideration however tough operational requirements warranted more conventional counterbalanced type forklifts. Mr. Bill Walker, Sr. Account Manager with Eastern Lift Truck, carefully assessed their handling and storage needs. Working together with John Harper, Operations Manager, Bill Walker proposed a plan that would allow them to achieve their goals by increasing the versatility of conventional forklift trucks. The solution: Add KOOI-ReachForks® to Yale model ERC050GH and implement a double-deep storage system. This allowed Vertis Communications to increase storage density, maintain the operational benefits of their Yale counterbalance trucks and avoid a capital investment for narrow aisle forklift trucks. Several months after implementing three trucks fitted with KOOI telescopic ReachForks, a fourth machine was added to help cope with the demands of their growing business.